Every hair salon client is unique in their wishes and, from color to style, has an individual goal. What they have in common, though, is the desire for their hair to look as beautiful as it possibly can. Thick, flowing hair that has a wonderful silky softness is seen as the ultimate attainment by almost every client who walks through the doors of the salon, but many factors can interfere with achieving this goal. Those with fine hair, for example, can suffer from excess static, while those with thicker tresses can find their hair weighed down and lifeless. One of the keys to running a successful salon is to have the perfect products to hand for addressing clients’ hair complaints, not just on the day they are having their hair styled, but in the weeks to follow as well. One essential that should be in every stylist’s repertoire is Karité from René Furterer. 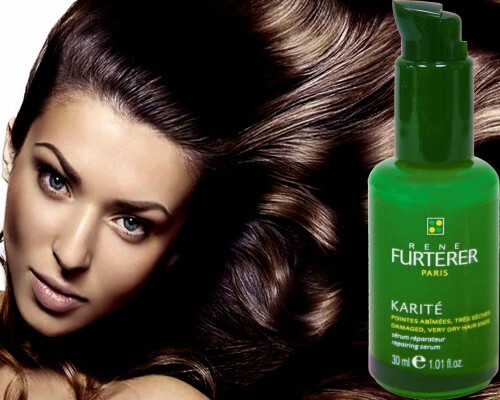 Karité is an intensive treatment for very dry, damaged hair and scalps. Dry hair can be caused when the scalp doesn’t make enough oil to moisturize the hair sufficiently. It is oil that is made in the root of the hair that gives hair its gloss and shine, so if the scalp doesn’t make enough oil, or the hair lets moisture escape, hair can become dry and brittle. If the scalp is dry too, flakes of skin may peel off, leaving dandruff on the shoulders. Dry hair was once seen as an inevitable consequence of aging, but modern products that combine nature with technology are banishing it to the past and René Furterer’s Karité is leading the field. Karité harnesses the power of Shea butter in order to nourish hair like never before. Even the most parched, brittle strands are revitalized as the rich treatment infuses them. The essential fatty acids and vitamins packed into the Shea butter and oil leave hair feeling soft and silky, while the aromas of orange blossom, verbena and vanilla provide a wonderfully refreshing fragrance. Karité combines all of this splendor into a deeply conditioning mask for in-depth restructuring of even the driest hair. Karité is a once a week treatment, which is designed to be left on the hair for between 5 and 20 minutes, depending on the level of nourishment required. As well as containing Shea butter and oil, it features the best of both nature and science. Quince pectin, for example, gives the product a smoothing element to leave hair feeling silky, while phospholipids repair and Cimentrio® (a complex of phytosterols, ceramides & essential fatty acids) works to rebuild the structure of the hair’s keratin. With products like this to hand, stylists are able to support clients to have the hair that they deserve, not just on the day they come to the salon, but every day, with this little pot offering protection from the elements and leaving clients flicking their hair like they’ve just stepped off the set of a shampoo commercial. Full-service designer and hair color specialist Rodney Gentry can be reached at Sachi Studios in Scottsdale AZ. Call 480-639-2000 to make an appointment and ensure that you get the color you deserve.